May 1st is the “perfect” day to celebrate chocolate desserts: it’s National Chocolate Parfait Day! It also marks a special occasion: today we are 1/3 of the way through our food challenge. Four months down, eight to go. We still have a lot of ground to cover, but we’re making progress. I’ve begun dreaming of 2014, when we’ll be able to eat whatever we feel like on any given day. Seems like such a novelty now. Which is not to say that I’m not enjoying this project. I am. We both are. But it’s definitely a lot of work! And expense. As alluded to above, parfait is a French word meaning perfect. It was invented in 1894 in France (duh) and was originally a frozen dessert consisting of cream, sugar syrup, and eggs. Nowadays it may also contain frozen custard, whipped cream, sauce, and fruit, and is usually served on a plate rather than in a glass. The preparation varies by country. In the U.S., parfait describes a chocolate mousse or pudding layered with whipped cream, fruit, and cookie crumbs or other toppings. No matter how you partake of your parfait, you will find it c’est magnifique! We partook of our parfait by preparing a prepackaged pouch of pudding perfectly. 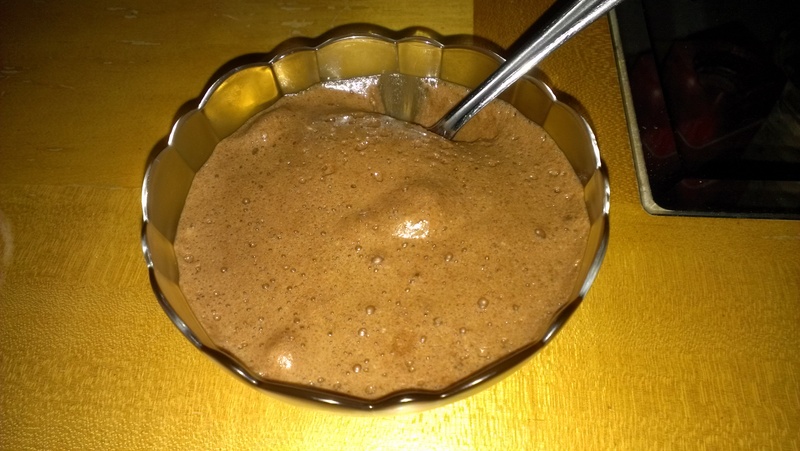 Instant chocolate pudding, to be exact, and both fat-free and sugar-free, to boot. 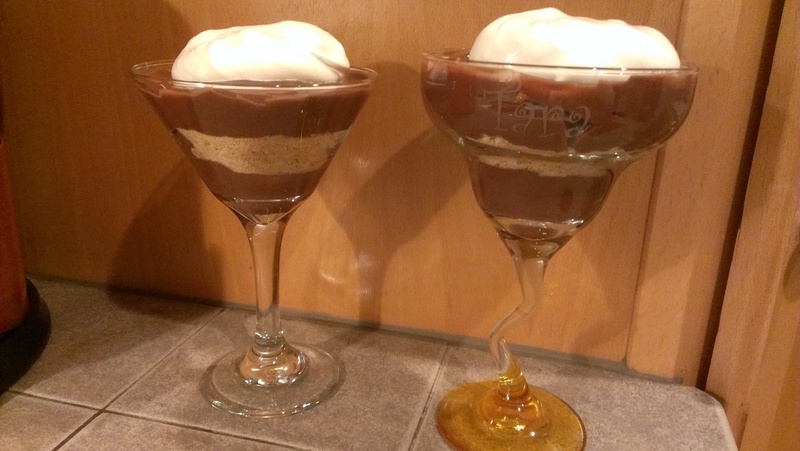 We layered that in a glass with generic Cool Whip and crushed graham crackers, and voila! A quick and easy parfait. You’ll be foaming at the mouth in anticipation of today’s food holiday. April 3 is National Chocolate Mousse Day! A moose is the largest member of the deer family, and found primarily in Alaska, Canada, and Russia. Males have distinctive leaf-shaped antlers. Dipped in chocolate, they are a decadent treat. Wait. I’ve just been informed that this is chocolate mousse day. My bad. A mousse (hey, anybody could make that mistake!) is a light, airy dessert made with whipped egg whites. Its history is unclear; all we know is that Conquistadors brought chocolate to Spain in 1529, and when Spanish princess Anne of Austria married French king Louis XIII in 1615, she packed lots of chocolate in her carry-on bag. French chefs began experimenting with the sweet treat, and by the 19th century had combined mousse (which literally means foam) with chocolate to form mousse au chocolat. Chocolate mousse first appeared in the U.S. during a food exposition in Madison Square Garden in 1892. Five years later, a recipe appeared in a housekeeper’s column in the Boston Daily Globe. These versions were more pudding-like in consistency, however. It wasn’t until the invention of the electric mixer in the 1930s that the fluffy, airy mousses (meese?) we know and love today came about. The secret is in whipping those egg whites to a frothy perfection, something difficult to achieve by hand. 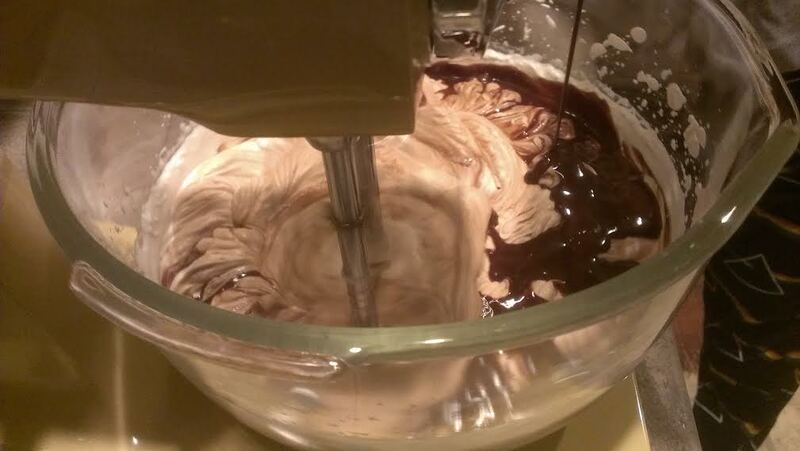 Tara stepped up to the plate and offered to make a chocolate mousse from scratch. I was excited because I wanted to hang the antlers on the wall (see above faux pas), but I was pretty happy for the other kind of mousse, too. Since Julia Childs’ Coq au Vin recipe was such a success, it was easy to choose her Chocolate Mousse recipe from the dozens that came up when I searched online. Also like her Coq au Vin, there were several steps (and lots of dirty bowls) that included using a double boiler to melt the chocolate and whip the sugar and egg yolks, cooling said sugar and yolks in a bowl of ice, and whipping egg whites with first a pinch of salt, then some sugar, and finally a splash of vanilla. I’m not the type of baker to lay out all my ingredients before hand so there was a lot of back and forth to various cupboards for bowls, measuring spoons, and ingredients. Normally this isn’t a big deal in a kitchen our size, but when Mark is sharing counter space while making meatballs for his Italian Wedding Soup…well, let’s just say I had to politely shove him out of my way a few times. Move, babe! The egg whites are going to break! I have to stir the chocolate! 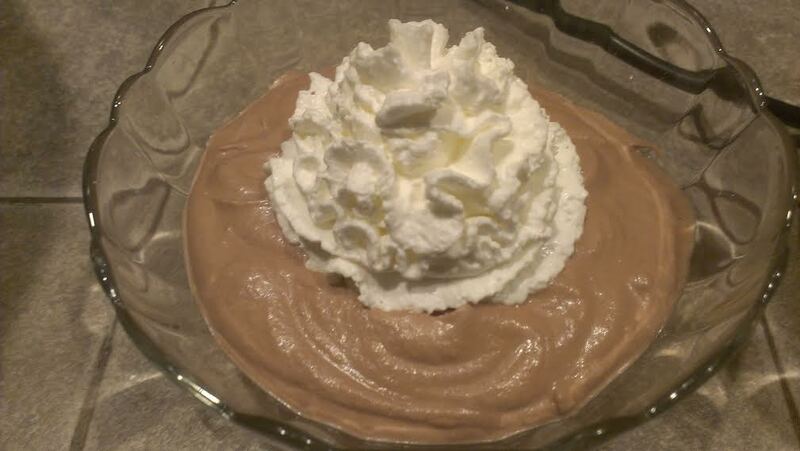 Frantic shoving aside, the mousse turned out great. Rum and coffee helped keep the chocolate rich and not too sweet. Magnifique!